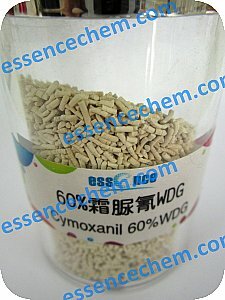 Cymoxanil(CAS No.57966-95-7) is a foliar fungicide with protective and curative action. Has contact and local systemic activity, and also inhibits sporulation. Cymoxanilis used for controlling of Peronosporales, especially Peronospora, Phytophthora, and Plasmopara spp. Normally used in combination with protectant fungicides (to improve residual activity) on a range of crops, including vines, hops,cucumbers, potatoes, and tomatoes.